On a traditional brick garage the walls can either be single skin or double skin and built with a cavity. The external finish can be facing brick or imitation stone or real sandstone or roughcast on blockwork or traditional Scottish wet cast ready for you to paint. The choices are almost endless with this type of construction. Walls are usually built off concrete strip foundations of a depth of about two foot below ground level although exact foundation design can vary depending on ground conditions. Free standing or attached, double or single, with flat or traditional tiled or slated roofs. The perfect match for your house may be a facing brick, roughcast, or traditional stone built garage. 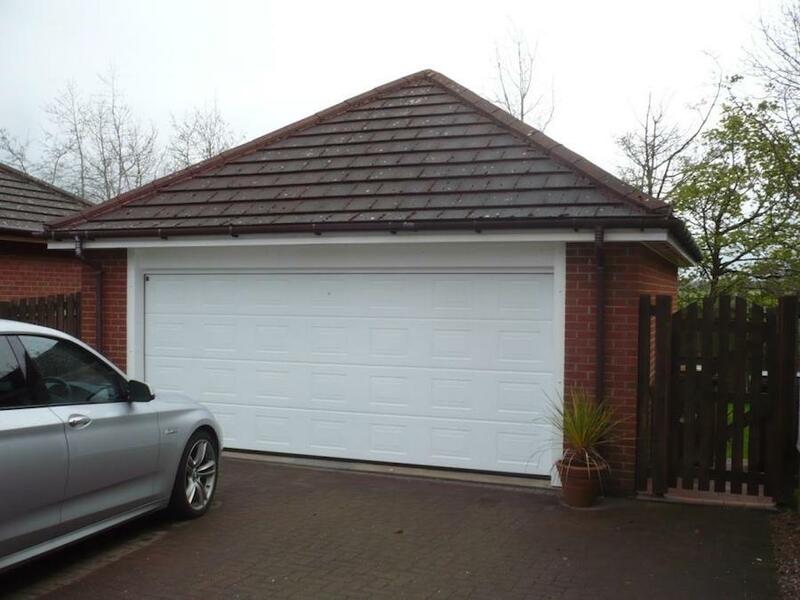 Our Brick garages are traditionally built to match your home, the options are almost endless. The choices are endless with a traditionally built garage. Typically it might either be a traditional flat felt roof garage or one using tiles or slates to match your house. The finishes for the fascias and bargeboards can be traditional treated timber left ready for you to paint or we can offer white, golden oak or dark rosewood coloured maintenance free uPVC fascias. Gutters and downpipes can be chosen to match your house and are usually PVC. These are available in a range of profiles and colours. The roof trusses for this type of garage are usually modern lightweight timber trusses, however, if you wish they can be designed to accommodate storage or even a playroom in the roof area of the garage. The size of a traditionally built garage can be as small or as large as you like and the heights can be as low or as high as you like. We can either advise you on what might suit your needs and provide drawings for you or we can work from your own Architects drawings. To see Door, Window and Roof options for your garage visit us at our main Glasgow South Display site at Uplawmoor where we always have staff on hand to offer you assistance. Alternatively contact us to arrange a free site visit.